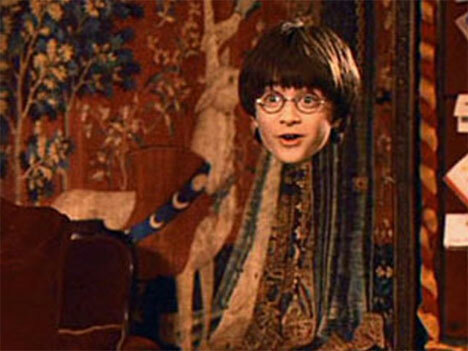 Invisibility cloaks have been staples in science fiction stories for years, and more recently they have been fodder for experimental scientists who want to prove that invisibility is possible. Most recently, a team at London’s Imperial College created a “space-time cloak” that can shield items or events from the view of anyone looking in the cloak’s direction. A space-time cloak would be made of “metamaterials” (man-made materials with extraordinary properties) that would effectively hide photons from the human eye to conceal objects without cluing in watchers. 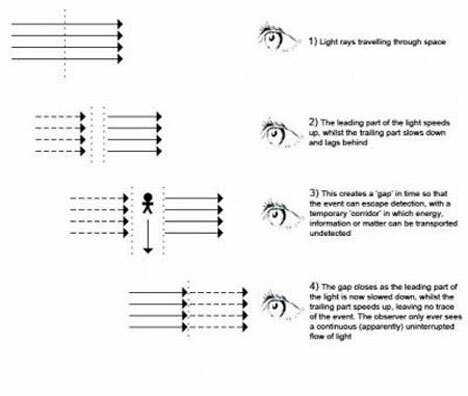 The cloak would do this by basically accelerating the photons closer to the viewer while slowing photons behind the object or event that is to be concealed. The cloak would create a gap in space-time which would hide whatever needs to be hidden. According to one of the researchers involved in the project, it would be like crossing a busy freeway. You would do this by accelerating the traffic in front of where you want to cross and slowing down the traffic behind your crossing space. This creates a gap in traffic (see animation above) which quickly closes once you cross and the traffic speeds return to normal. While there is a momentary hiccup, by the time traffic gets a few miles down the road the gap is completely imperceptible. The amazingly futuristic concept could have huge meaning for military and defense organizations around the world. See more in Science Fiction or under Science. November, 2010.